Finding teachers for North Carolina’s classrooms may be an increasingly difficult endeavor, as the ranks of those looking to become teachers dwindles. North Carolina’s public university system saw a steep enrollment decline in the last four years in undergraduate and graduate teaching programs, amounting to a 27 percent drop from 2010 to 2014. The enrollment decline is raising concerns in the public K-12 education and higher education realms, as both systems look to see how future classrooms will be staffed as public education continues to undergo rapid changes. 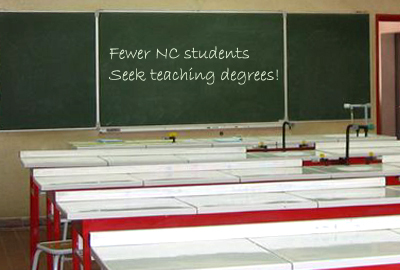 The UNC system produces most, but not all, of the state’s public school teachers. Nor have the full effects of the enrollment slowdown been realized. The real struggle is expected to crest in several years when school districts search for new teachers from a shrinking pool of qualified educators. The causes are numerous, from a national decline in interest in the teaching profession to frustrations with North Carolina’s low teacher pay and recent policy changes from the state legislature. “It’s just been a perfect storm,” said Wynetta Lee, the dean for N.C. Central University’s education school. The 2011 state legislature, newly empowered with a Republican majority that continues through today, passed legislation that phased out the N.C. Teaching Fellows program, a competitive scholarship program established in 1986 for undergraduate students who pledged to teach in North Carolina’s public schools. This spring’s class of 400-plus students will be its final class. The solutions to the declining enrollment and anticipated teacher shortages are as varied as the causes, Chapman says. Turning around the declines will need to include reexamining how students are recruited to education colleges as well as retention efforts aimed at teachers in their first few years in the classroom. “It’s a shared responsibility,” Chapman said. Just how to increase both the quality and quantity of North Carolina’s public schools teachers will be one of the topics covered today at a day-long education summit the UNC Board of Governors is holding from 10:30 to 5 p.m. on the SAS Campus in Cary. Ann Goodnight, a UNC governor for the past year and wife of SAS co-founder Jim Goodnight, coordinated the summit to examine how the state’s K-12, community college and university systems interact. Her group is expected to reveal several recommendations today about how to improve the state’s public education system, including development of future teachers. “It’s not just a North Carolina problem, although we are very concerned here,” Goodnight said. Lee, the N.C. Central University education dean, says the negative attention about North Carolina ranking near the bottom in teacher pay has been one factor keeping enrollment down. 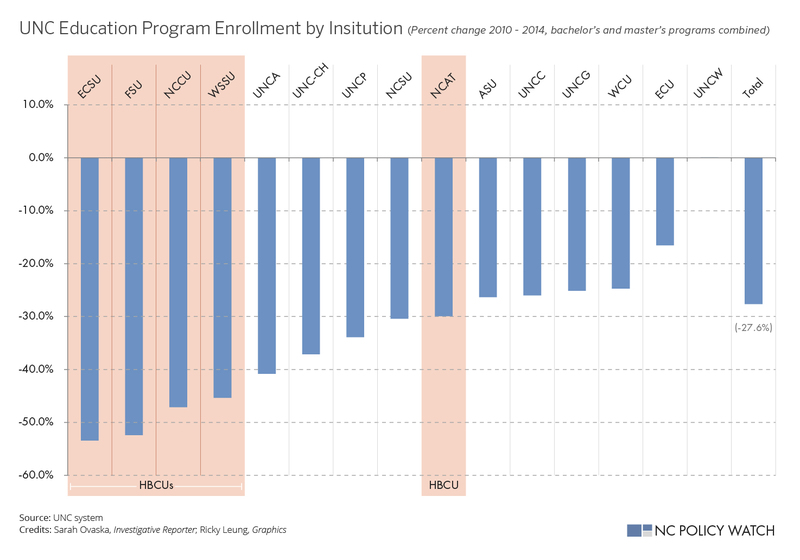 N.C. Central saw some of the steepest declines in enrollment. In 2010, 420 undergraduate students were enrolled in the school’s education program. That dropped by a third to 282 this past fall. 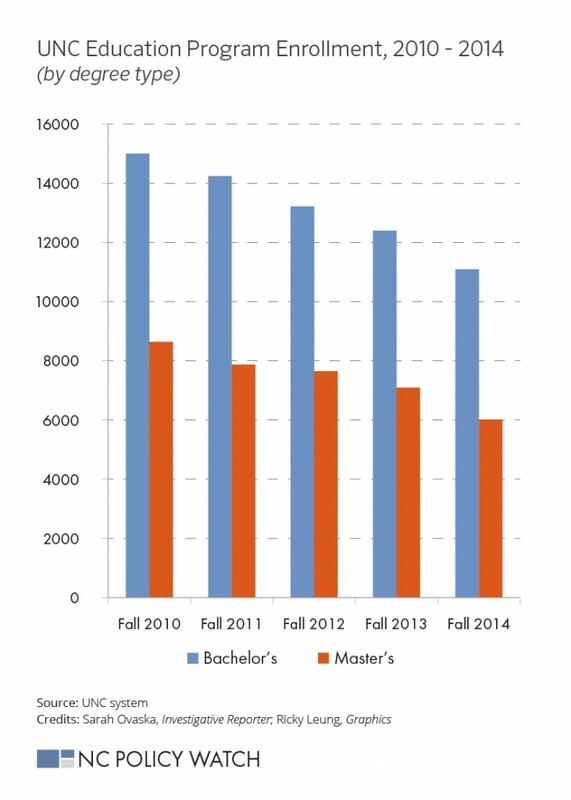 The master’s program dropped by 65 percent from 2013 to 2014. The low pay is combined with other factors like increasing tuition costs for students and federal changes to loan qualifications that have disproportionally affected the country’s historically black colleges. The state public university system’s other HBCUs – Elizabeth City State University, Fayetteville State University, N.C. A&T and Winston-Salem State University – also saw significant declines in their education enrollment, with some accounting for the biggest drops in the UNC systems. Lee said that poses another problem for the state’s classrooms, with approximately half of the nation’s teachers of color graduating from HBCUs. Michael Reed, a 46-year-old Orange County man, may be the type of new teacher the state will increasingly try to recruit into classrooms. Reed is finishing up his final semester for a bachelor’s degree in education from N.C. Central University, after spending the two decades since high school working in the automotive industry. He found himself wanting to get more from his career, and hopes to be teaching middle-school math or science this coming fall. He’s been taking classes at both Durham Technical Community College and N.C. Central University for the last four and a half years, while his wife’s salary has served as the family’s sole income. Though enthusiastic about his new profession, he wishes teaching got more support in the state, something he hopes will change.